Now available from Bsafe , the HexArmor Gator Grip specialty safety glove has been designed for the offshore oil and gas market in mind. The Gator Grip specialty safety glove features GGT5 technology, a design platform that combines high performance materials engineered to provide cut and puncture protection and a strong grip in any oil situation. This safety glove exceeds EN388 cut level 5 in the protected areas. Padded protection on the back of the hand and fingers reduces impact injuries, while the special grip prevents formation of oil film and displaces oil allowing maximum contact with tools and other equipment in saturated situations. Made with SuperFabric brand material for the a cut-resistance that exceeds ISEA and CE Level 5, these specialty grip gloves feature innovative puncture protection technology to ensure workers hands are safe from wickers, burrs, and cable wire. Washing machine safe, these Gator Grip gloves are also suitable for usage in other mining areas, construction, metal and railway industries. 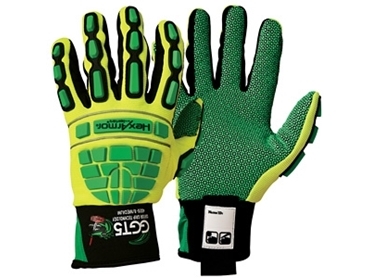 protection for the back of the hand with the impact absorbing protection plates. Gator Grip GGT5 technology and other products from HexArmor will be on display at the Bsafe stand (#1265) at the Queensland Mining and Engineering Exhibition in Mackay from the 27th to the 29th July, 2010.